Our sanct uary is an intimate space, a warm and comfortable room. Typical of sanctuaries from the last quarter of the 20th centuries, it has an energy-efficient low ceiling. Built in 1978, it was redone in 1998, including new lighting both for use and effect. New seating was acquired since 2005. On Shabbat and festivals, the service is conducted from the floor level, creating a nearness between the service leader and the worshipers. The old style “cathedral” with high ceilings and distant clergy (and hidden singers) is very much in the past in our modern building. 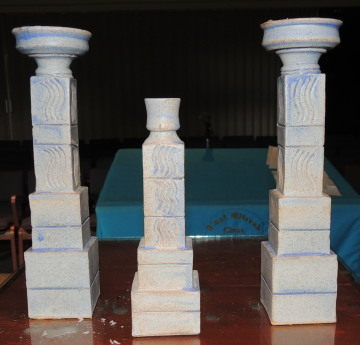 Our candlesticks are a unique three-piece set commissioned through the Rabbi’s Discretionary Fund. Made by Renee Vichinisky of Judaica Pottery in Ulster Park, NY, they consist of two tea-light holders with a matching shamash candle-holder. A symbol of tradi tion adapting itself to change, the magnificent Ark that is the heart of B’nai Sholom’s Sanctuary originally graced the former Congregation Beth Emeth building at Lancaster and South Swan streets in Albany, which was built in 1889. Shaped by hand, the Ark has seen more than a century of turbulent Jewish history, from the emergence of a vital Reform movement through the Holocaust, the most devastating assault on Judaism and civilization, since the destruction of the Second Temple. And it has seen the birth of the State of Israel, a tree of hope for Jews here and all over the world. 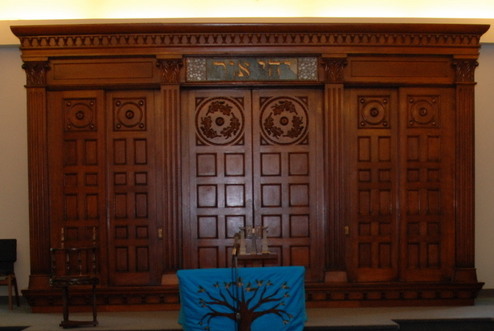 Above the handcrafted wood doors are the Hebrew words “Yehi Or,” “Let there be light,” the first words, according to the Torah, God spoke at the creation of the world. These same words were used by Isaac Mayer Wise, founder of American Reform Judaism, in the title heading of his newspaper “The Israelite,” in 1854. Rabbi Wise was the spiritual leader of Congregation Beth El (founded in 1858) of Albany. As is common in America, neighborhoods change, and the old downtown synagogue was sold to a church. Twenty-five years later when our current building was under design, our congregants heard the old Ark was going to be torn apart and made into cabinets, since after all, churches don’t need fancy closets up front; they needed more room for their choir. The Ark was rescued, dismantled, and rebuilt by Kurt Holsapple in its new home. B’nai Sholom is thus placed at the heart of Reform history: Albany’s Orthodox Temple Beth El, founded in 1838, was the first congregation of Isaac Mayer Wise. 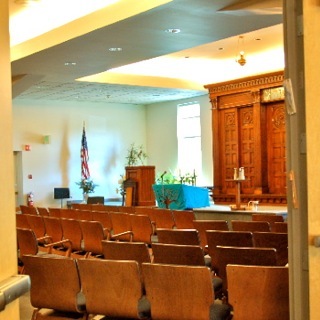 A split resulted in his supporters forming Anshe Emeth, the fourth Reform congregation in America. Inside our Ark are two scrolls. Our regular Shabbat Torah is believed to be from the 1920’s, most likely from Europe, and is nice and clear to read from. While not small, it is fairly compact and all our 13 year olds can carry it. 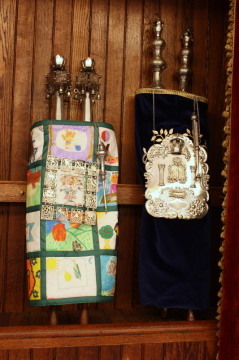 We purchased this Torah in 1988 from J. Levine & Co. on the Lower East Side using the proceeds of the Hannah Jaffe Torah Fund, plus a generous gift from Joe and Ruth Ottenheimer. Our other Torah is one of the Czech Memorial Scrolls, on permanent loan from the Czech Memorial Scrolls Trust. These are 1,564 scrolls from Bohemia and Moravia that were confiscated by the Nazis for placement in a planned “Museum for an Extinct Race.” More than 85% of the Jews of Bohemia and Moravia who were unable to flee before 1941 were murdered during the Holocaust, chiefly in Auschwitz. After the War, the scrolls were taken to London, where they have been distributed throughout the world. We received our scroll, which is from the village of Chotebor, in 1971. It is a kosher scroll -we have it inspected and maintained periodically – and we read from it on holidays and certain other occasions. The scrolls distributed in recent years are pasul (not kosher) and cannot be used for public reading in the synagogue. This scroll has a beautiful lightweight parchment and is longer than our other scroll. Our sofer (Torah repairman) believes it is from the 1850’s and was all written by one person. The differences in calligraphy in it, he says, are due to different quills used in the writing. In some places it is harder to read than others because there is not much space in between the words. Those who read from this scroll, however, feel privileged to do so. 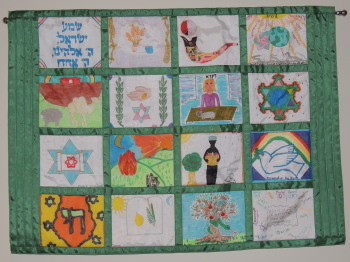 Wall hangings in the sanctuary are Torah Covers created by the students of the B’nai Sholom religious school.